That's good progress. I like your organised approach. I like the tab on the bottom of the post - there'll be no need for a big wrench. Are you still going to incorporate a flange? RussellT, thanks ......and definitely will add a skirt to the post. awemawson, afraid the swarf just went into the dustbin. Wish there was a use for it! You don't lose so much, and drilling and boring go a lot easier with cored out castings. 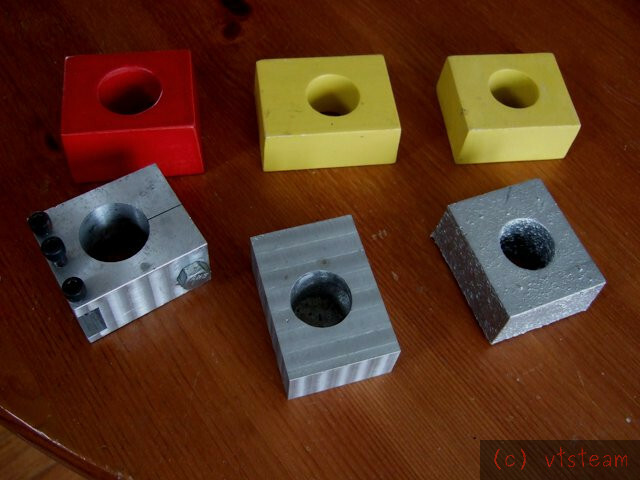 Below is a pic of a few of the patterns and aluminum holders I made five years ago for the Gingery lathe. The hole has draft just like the rest of the pattern and I bored the wooden patterns on the lathe with the compound slide. The thicker holder suits a cutoff tool. I hope to cast iron with my new furnace when the weather finally cooperates. I finished up boring the last of the toolholders for the center post today. Then got ready to drill the clamp bolt hole. I marked all the block corners for the new face. Then I pulled all of the jaws out of the chuck and reversed them. Then I placed a block into the chuck and roughly located it to the area that would need to be drilled. That was off center a lot for this particular drill location and I changed the drive belt down a couple pulleys because the balance would be off a fair amount. Then I marked up the piece in the chuck, scribed cross lines and popped it with the center punch. A put the dead center in the tailstock, moved it in from the other end of the lathe (3 foot bed) where it had been, out of the way while boring with the carriage. I was expecting to have to adjust all 4 jaws back and forth for a few minutes to line things up. I don't have a second chuck key....yet. 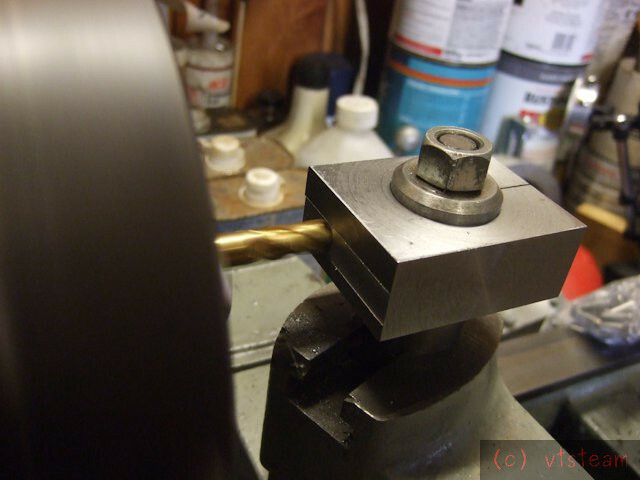 I slid the tailstock close and tightened it down on the ways. Then wound the center in toward the block. Wow, I thought. Pretty close. Are you kidding me?????? What the...? The center was dead on to the center pop. I mean absolutely dead on! Take a look. What are the chances of that -- with an off center location, not even marked before being placed in the jaws?? 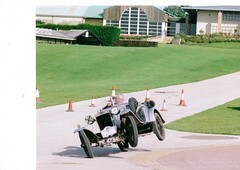 I could wind it in all the way and it just touched right on - - not the slightest side movement. Perfect alignment. Unbelievable! 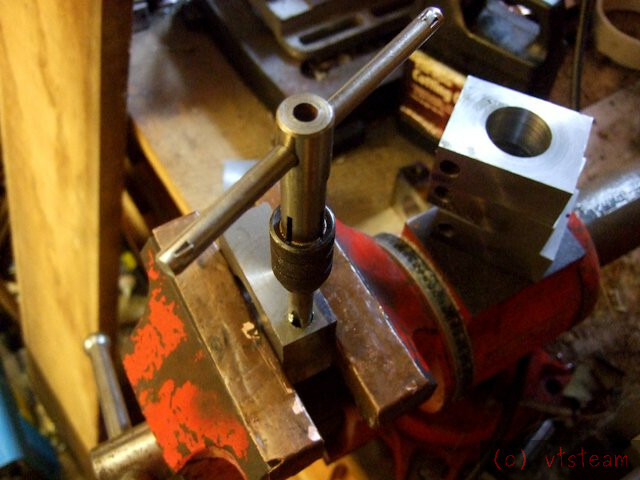 For this type of work a pump center or spring center works great, put it on you to do list as it will be a handy accessory for off set things in the lathe for future projects. A knurling tool (I have knurls but not a holder), and a Morse taper adapter for the headstock -- it's #3, and all my useful tooling for it is #2. I don't have a collet chuck. Drilling 5/16" to 1-3/4" depth for threading. After that I drilled 3/8 to 1" for the clearance hole. But this turned out to be a mistake. The 3/8" x 16 TPI tap wouldn't fit in the clearance hole. I measured the 3/8" drill bit and it was .372" -- the tap was .376" so no go. 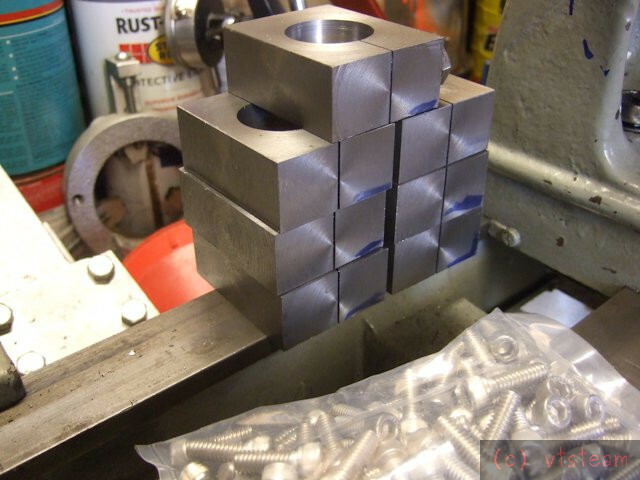 I had to re-drill all blocks to 25/32" to clear the tap. Clamp bolt holes all tapped. 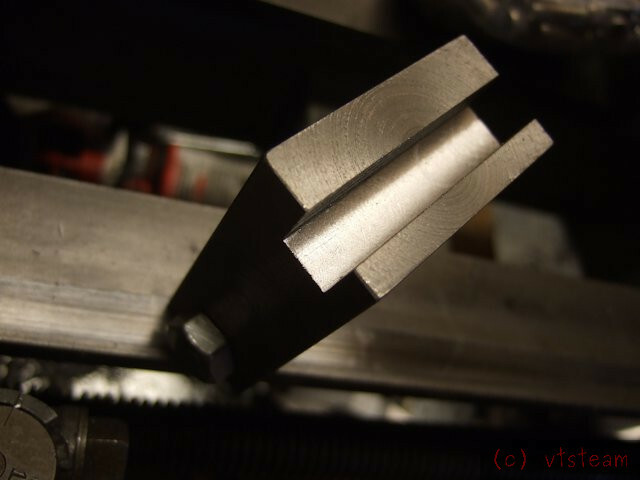 Slitting (with the newly cleaned up milling vice!). Checking the closing action with the old toolpost. Works great. Brave guy! I wouldn't even think of slitting that much steel. Maybe brass but not steel. Well maybe fools rush in! I haven't done much slitting -- although did my older steel tool holder the same way a few years ago. But, I was pretty cautious, took half a dozen passes at it as slow as I could crank the table, 160 rpm at the cutter on a 3" x .032 blade, used Synkool water soluble coolant sprayed on. Didn't seem to be a problem at all. Just took my time. Pretty quiet, no heat. Was a little worried about the breakthrough at the end in case the kerf closed up, had one hand on the stop switch, but that didn't happen either. It was actually a piece of cake. I suppose it depends on how much residual stress is left in the block - if it had been normalised it should be OK, but untreated cold rolled could be quite an issue. It was hot rolled, faced on all sides. All holders slit. It was uneventful, and though i"d taken as many as 6 passes to complete to begin with, I found that by taking it slowly, it really only required 2 passes by the last few blocks. Important to judge feed by both sound and feel. A bit of coolant was also helpful. It went well and I'm very happy with the result. 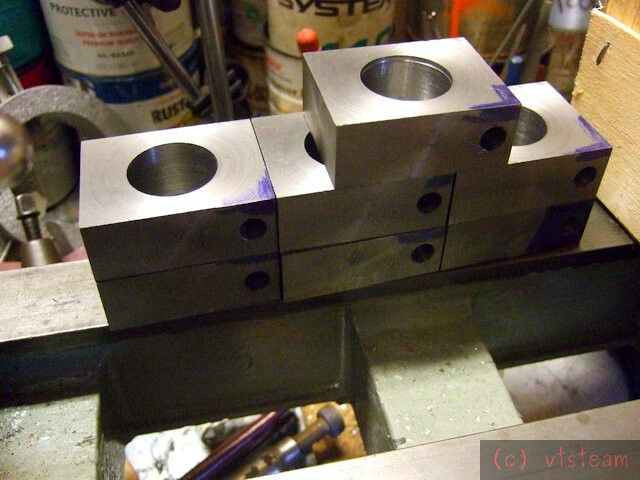 Also in the pic foreground, the stainless steel socket head cap screws arrived for the toolholders. Scored for $8 per 100. They were a better deal than the plain steel versions. First slitting, now slotting. First milling pass. I decided to do this in the lathe instead of the mil to show someone without a mill how the whole process cab be done that way. Well the slitting wasn't, but could have been if you have a boring table or milling attachment. Or possibly padded the tool holders above the carriage. One other possibility would be making a jig using a horizontal section of rod the same size as the regular tool post. As you can see the toolpost works well as a vertical milling adjustment for the tool holder. 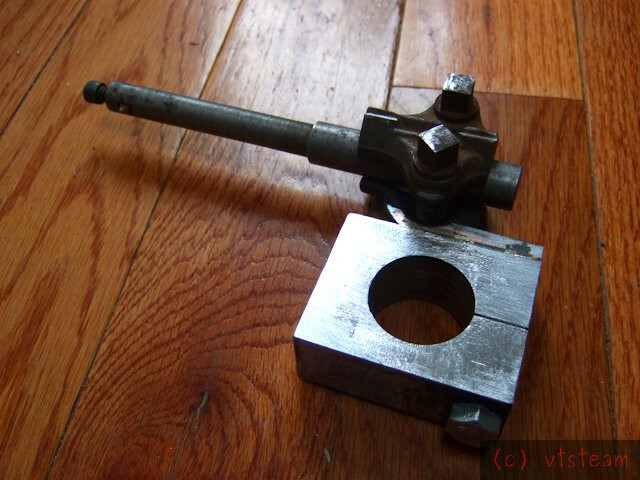 In fact I'm thinking that for very simple milling of small parts, you could make a tool holder in the shape of a milling vice that would be tightened onto the tool post. 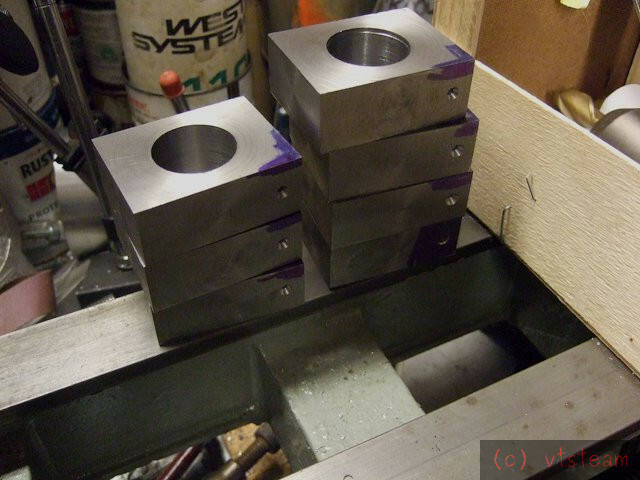 I slotted three of the new tool holders conventionally, and then I made a couple of specials today. The first one, shown below, was originally intended to take a cutoff tool. To make it, I brazed two pieces of 1/4"steel top and bottom to allow for the extra tool thickness. 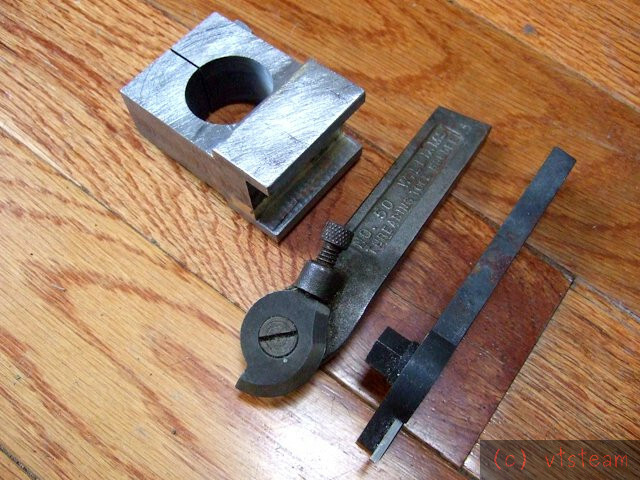 As it turns out, it will also accommodate my lantern style Armstrong tool holders, including the cutoff holder. Also shown here is a cool threading tool I haven't yet used. It has a snail shaped tool bit profiled to cut a 60 degree thread. 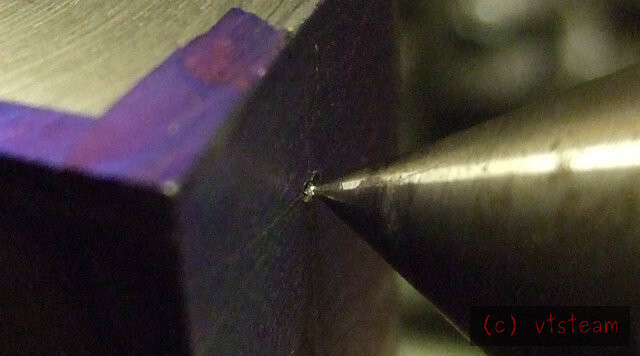 To sharpen you just rotate it slightly and grind a new flat across the top. It's offset and raked already. Also the cutoff tool holder -- I may just mount a cutoff tool this way instead of blade only in the QC tool holder. Nice to still get some use out of these holders. The second special tool holder is for boring bars. 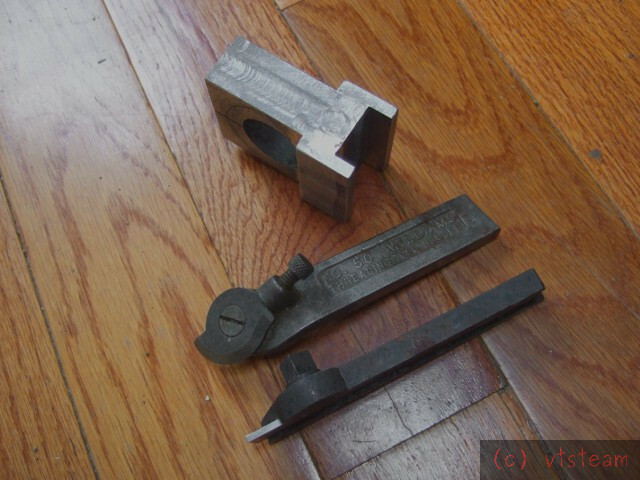 I was originally just going to bore a hole in the block to fit a 5/8" bar shank. But I realized there wasn't room in the blank to clear the center post hole. It might be beneficial to anyone else doing the Mason design to make the holders a little larger than his 2 x 2-1/2" x 1" spec. 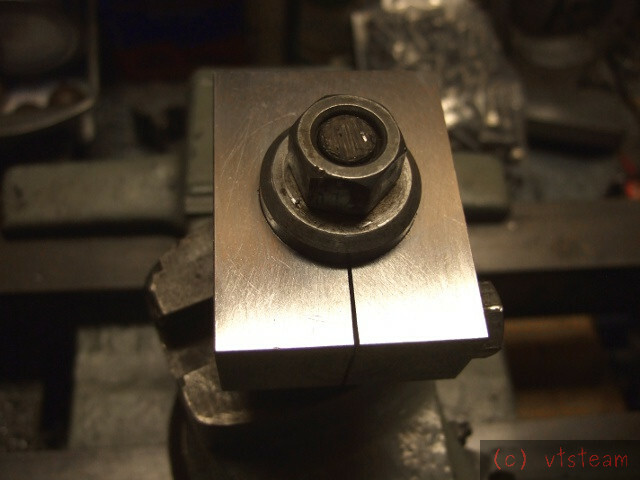 Anyway, I decided to cut off the shank of my Armstrong style boring bar holder, and braze it to the long side of a QC holder(instead of the end). Shown below. I like this design a lot because it accommodates a wide range of bar sizes. It has two square head cap screws to hold down a vee block which is reversible. You can see the shallow groove on top for smaller bars. The underside accommodates at least a 5/8" bar. 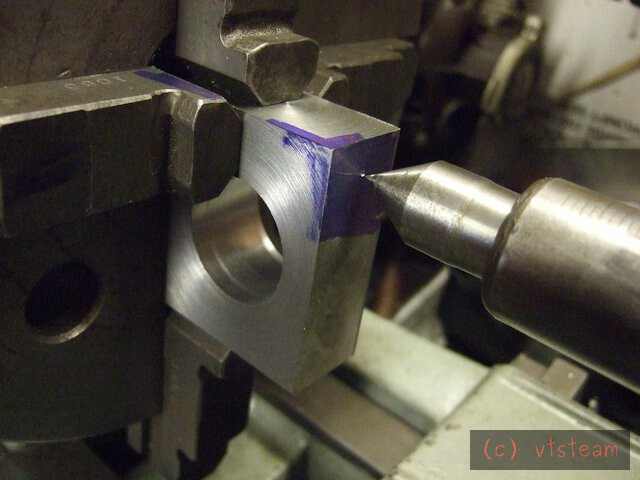 I could still slot the end of the QC holder blank to accommodate a facing tool. But not sure how useful that would be. Getting a really nice collection together. I have that same thread cutting tool and it works pretty good. 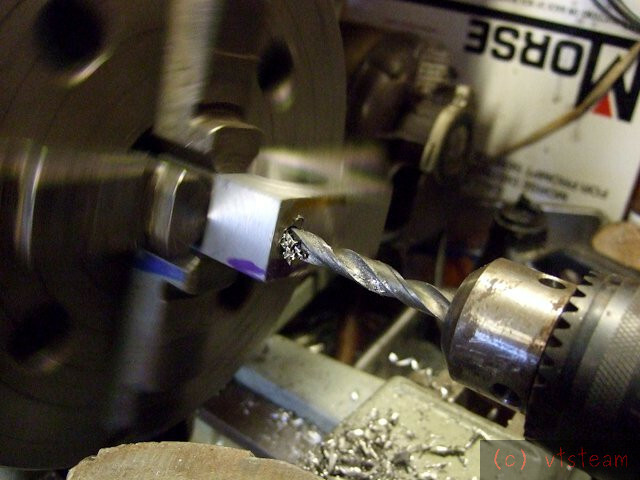 Just a thought: would a hole saw be quicker approach to drilling a big hole on a lathe. They have turned out great and at least you can use your old tooling in them and some of your newer gear. Looking good - excellent collection. You just need to slip them through Robs nickel plating line and they'll be ready for the display cabinet. Thanks black85vette, Davo J, Anzaniste, and awemawson! Anzaniste, I haven't tried a hole saw on something this thick before. I did do a tube sheet in my drill press that way, and it really wasn't turning slow enough. Quite a bit of screeching and smoke, despite sprays of coolant from a bottle but it got the job done. Very unpleasant though. I suppose that it could be done better if it was run on a mill at slow speed, but I think it might take a while. You would still have to re-mount on the 4 jaw in the lathe and bore out to a close sliding fit. 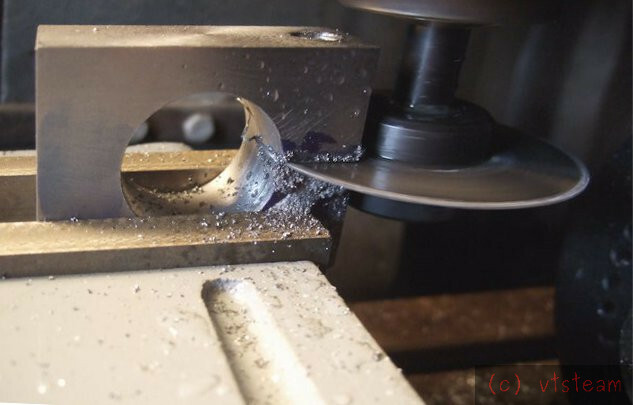 On my lathe, I think a hole saw might be hard on the MT-2 taper tail stock and Jacobs chuck. But maybe I'll try it some time. My ideal would just be to cast these in iron when I have the CI casting ability (coming up shortly). Then the hole is simply cast in. Doesn't even need a core. Still has to be bored, though. awemawson, I agree. I'm not proud of the finish. Hoping Rob will at some point reveal all in a tutorial. I don't own a surface grinder, or a belt sander, and don't have a buffing wheel set up. My tool grinder needs both abrasive wheels. But I will work on these holders further by hand to get them more presentable when the whole set is done.